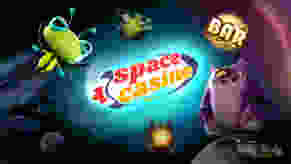 Space Casino 1000 games from outer space! 7 day to wager the winnings from the spins. Space Casino was launched into space in 2017. It is licensed and regulated by the government of Curacao. Now it looks like it’s heading to the center of the Universe to bring them, aliens, the pleasure of gaming. The Casino is owned by Direx N.V. group, which is widely known for its modern casinos with great design and a decent game variety. Their casinos bolt to the top of the market as soon as they open their doors, easily beating many older ones as 7 Sultans Casino or Unique Casino. There is nothing amazing about the casino’s design, but the website looks rather stylish and has all information conveniently placed at hand. There are three languages for you to choose from, and the navigation is okay. All the links are easy to find so that you won’t get lost there. Customer Support: If you need help, you can reach the support agents via email or live chat. Feel free to contact them at any time - these guys work round the clock, and they are very fast. We tried the chat, so we know what we are talking about. There is no phone support in space because they can’t connect wires to their spaceship. Banking: Space Casino offers a pretty long list of withdrawal methods. It includes Neteller, Skrill, Trustly, and some other options. The maximum withdrawal amounts are €4,000 (per transaction and per day), €10,000 (per week), and €30,000 (per month). Jackpot winnings can be an exception from this clause. Most of the withdrawals are processed instantly, but if you use credit cards or bank transfer, it can take from 1 to 5 working days. Other games: Scratch Dice, Scratcherz, Donut Rush. They even have a separate section for Bitcoin games, in case you’re interested. Space Casino offers more than 1000 games! You can’t really use your smartphone in space - there is no signal there. But Space Casino doesn’t have such problems - you can play it on your smartphone or tablet without any difficulties. There over 2 dozen of live games available there: Baccarat, Roulette, Blackjack, and some others. If you deposit over €100 (or 50 mBTC), you get 150 spins. Your first deposit can bring you a 100% bonus up to €400 plus up to 150 free spins. The minimum amount you have to deposit in order to get this bonus is €20 (or 10 mBTC). The wagering requirements are okay - 40 times the bonus and 20 times the winnings from the spins. The cash bonus and the winnings from the spins must be wagered within 14 and seven days respectively. The only drawback is that the maximum bet during the bonus wagering is €1 if the deposit was below €99. It’s really weird, and you better remember it, while claiming a bonus. We did our best, but we didn’t manage to find any serious drawbacks except the trick with maximum bet. Space Casino has plenty of games, provides great support service, offers a nice welcome package and allows you to withdraw your winnings pretty fast. Yeah, we remember about those time constraints, but the welcome bonus wagering requirements are great, so meeting them in time shouldn’t be a problem. Put your space suit on, and click here to visit Space Casino.